A mouth-watering catchweight fight between Adrien Broner and Mikey Garcia are said to be in the works for July 29 on Showtime Boxing in a fight at the Barclays Center in Brooklyn, New York, according to RingTV. Negotiations are going on between the two camps. It’s a great fight, especially Broner. He needs a big right now to revive his stalled career which appears to be heading downwards despite him being only 27. It’s unclear what weight Garcia (36-0, 30 KOs) and Broner will be fighting at, but it would likely be in the low 140s. At this point in Broner’s career, he really struggles badly to make 140. I think he can make that weight in a pinch if it’s a big enough fight for him to be willing to train hard. As we saw in Broner’s last two fights against Adrian Granados and Ashley Theophane, he just does not seem capable of fighting at 140. Hopefully, Broner doesn’t wind up eating himself out of the 147 pound division as well, because he’ll never have enough size to compete at 154. Broner would be a sitting duck at junior middleweight for any halfway talented fighter. Mikey Garcia could have a big advantage over Broner in hand speed and power, as well boxing ability. Mikey has looked incredibly good in his last two fights. In contrast, Broner looked terrible in his last two fights. The one thing that Broner has going for him is he’s used to fighting at welterweight and taking shots from bigger guys. Mikey hasn’t been fighting welterweights, so he might struggle with the power and endurance of Broner. The venue and date for the Broner-Mikey fight could change. We’ll see what happens in the near future. 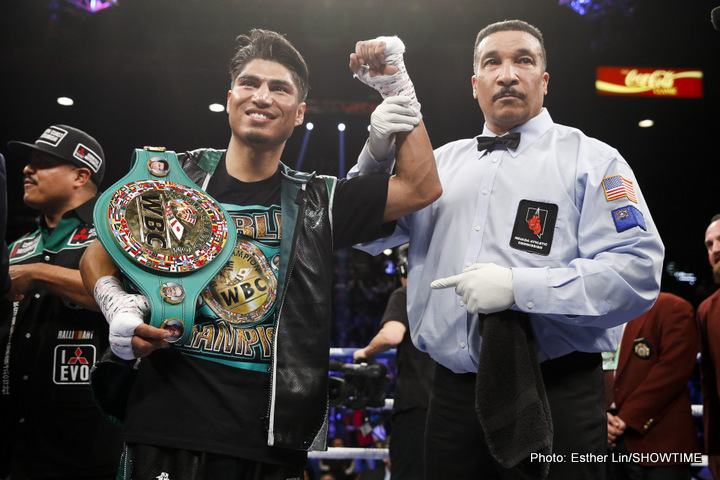 Mikey Garcia currently holds down the WBC lightweight title. He recently destroyed Dejan Zlaticanin. It would be easy for Mikey to go up from the 135 pound lightweight division to 142 or 143 than it would be for Broner to drop down to 137 for a catchweight. I don’t think Broner can do it. He’s been ballooning up in weight too often in between fights, and I don’t think he can cut down to below 140. Asking Broner to drain down to 137 could prove to be the impossible. Even if Broner did make the weight, I think he’d be too weak to fight on the night against Mikey. In Broner’s last fight earlier in this year in February against Adrian Granados, he had the weight moved from 140 to 147 when it became clear that he wasn’t going to be able to make the 140 pound limit. Granados was fine with the weight being moved, but Broner still looked drained for the actual fight. The fight was 10 rounds instead of 12. That was good for Broner, because he was not going to do well in a 12 round fight. Broner was very fortunate that he won the fight period, because Granados looked like the better fighter of the two. Broner ended up getting a 10 round majority decision win, but there were at least 5 of the rounds that were scored for Broner that should have gone for Granados. You can argue that it was a robbery on the night. In 2016, Broner failed to make weight for his title defense of his WBA World light welterweight title for his title defense against Mayweather Promotions fighter Ashley Theophane. Broner was lucky that he was facing Theophane instead of a tougher contender like Kiryl Relkh or Rances Bathelemy. Either of those guys would have been a real handful for Broner. Broner recently served a 3-day jail term in Kenton County, Kentucky. Broner looked flabby in the week before going to jail. If Broner is going to fight Mikey in July, he’ll need to burn off the extra weight that he’s carrying around. In video of him on Youtube, Broner was talking about wanting to eat food. He didn’t look particularly athletic. He resembled more an unmotivated fighter. Let’s hope that a fight against Mikey Garcia will help Broner find some motivation that has been missing for a while in his career. Broner is probably not going to do well if he stays at welterweight for any length of time. He might be better off mostly fighting guys from the 140 and 135 pound divisions. If Broner can occasionally make the 140 pound weight class for certain guys, he might be able to have more success with his career. Mikey hasn’t been involved in any big fights during his other than Orlando Salido, and that one didn’t end too well for him. Mikey suffered a broken nose from a lash of heads. Mikey’s corner pulled him out of the fight in the 8th. It looked more like Mikey was beginning to tire in the fight by the 8th. The broken nose seemed a convenient excuse to get out of the fight when Salido was starting to get to him.